E-commerce SEO can be challenging but when done correctly it is certainly worth the effort. E-commerce sites run into some SEO issues more often than other sites due to the fact that products come and go regularly. Today we are going to look at some tips for setting up and improving your e-commerce SEO strategy. One of the fastest ways to erode the quality of your online store is with a plethora of 404 pages. When you remove a product from your store, use a 301 redirect to send the visitor and the link juice of the old page to the new and relevant page on your website. If you do not have a new product that is relevant enough to redirect the old page to, you can create an informational page that covers a broad but related topic and displays products solving similar problems. When a site like The New York Times adds a new post it will often rank for several related keywords even though they did not do any direct SEO work to the post. As many of you already know, this is because the trust and authority of the domain. Even though the concept is simple, many people fail to use this as part of their SEO strategy, especially for e-commerce websites. Anchor pages are the best way to build trust and authority that can be used to promote new pages on your site. Let’s say for example that you sell widgets. You could have a page that serves as the authoritative guide on widgets. You would then promote the anchor page to people who have an interest in widgets, building trust, authority and topical relevance by gaining inbound links. Once you have built up authority, trust and topical relevance in your anchor page you can link to the product pages for your widgets, giving them a hefty boost in the rankings. When you remove a product, simply link the authoritative guide the new widget you are selling. Many e-commerce websites are plagued with duplicate content issues. While some sites face this issue because they have copied and pasted the manufacturers’ descriptions of the products, others have this issue because there is not any content outside of that created by the product page template. Regardless of how many pages your website has, you need to have at least a 100-word unique product description. If you can’t figure out what to say on your own, encourage user-generated content as well. Sites like Amazon perform very well through the help of user generated reviews and customer questions and answers. Not only does user-generated content help with the uniqueness of the page, it also shows Google your website is active as they can identify user-generated content. Written content is great but adding plenty of images and videos to your site can also help your cause. Google wants to reward sites that offer a great user experience and in keeping with that goal, sites that have rich and diverse media available are often rewarded. If you are not sure where to start, shoot a couple demonstration or review videos for products on your site. You can also take advantage of user-generated content by including testimonial videos about the product. Google aims to show users sites that meet their expectations and in order to do so, user engagement is considered in how highly a site ranks and how long it stays ranked. If someone does a search, clicks your page and then quickly returns to the search page, Google measures that as a sign your site may not be engaging or helpful. This measurement is known as dwell time. Even if you have great products, a lackluster first impression will send potential customers to your competitor’s website. Here are just a few things you should include on your website to give site visitors a sense of security. Reviews and Social Proof – According to a BrightLocal survey conducted in 2012, “72 percent of consumers trust online reviews as much as local recommendations.” Failing to provide reviews to your potential consumers can be a costly mistake. 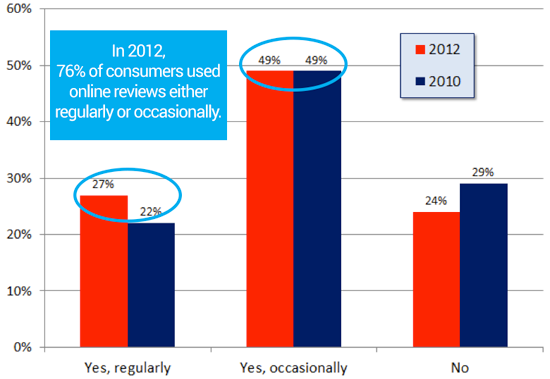 In the image below you can see the 76 percent of people admit that they use online reviews as part of their decision-making process. Don’t take a chance of missing out on all of those potential customers, incorporate reviews and testimonials into your website. Creating a successful e-commerce store requires great products and a ton of work promoting those products. Today we have only scratched the surface of how to better optimize your e-commerce website but implement these simple steps will get you closer to have a fully optimized and profitable site. What is one thing that you look for when determining is a website is trustworthy or not?